Not really something beefy enough to be a main computer, add the fact my Blu-ray player is SATA and currently housed in my desktop means I’d need to buy either a caddy or get a whole new external drive. So I’m now looking at £700 for a half decent laptop, to get something to match my desktop, I’m looking at around £1200. So as you might have guessed. I ruled that out. I end up looking at cheap laptops, ideally I was after something that was upgradable – I had a spare solid state drive and I wanted to be able to upgrade the RAM later if needed. Ideally I would like a Full HD (1920 x 1280) screen, unfortunately no-one seems to pack a nice screen on a cheap laptop, unless you want a Chromebook like Toshiba Chromebook 2. In the end it came down to the Lenovo ThinkPad E555 and the Toshiba Satellite Pro R50-B-12Q. In the end I let cost decide, the Lenovo was £50 more expensive (after the £50 cash back), so I went for the Toshiba. The Toshiba was just under £200 from Dabs. 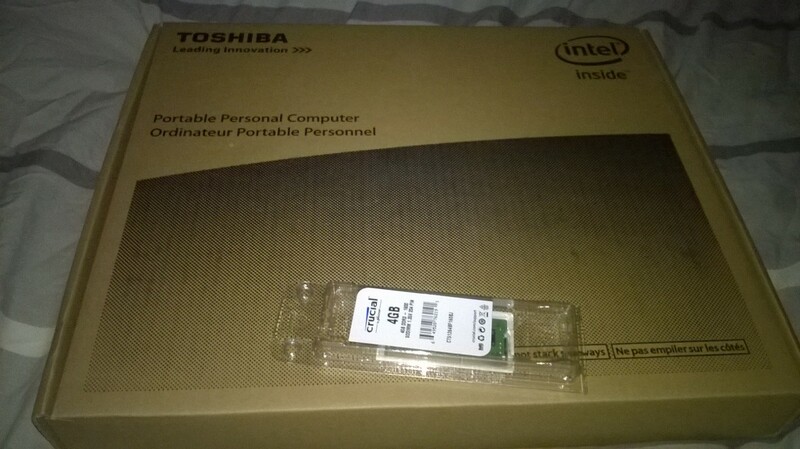 I also ordered a 4GB stick of RAM (Crucial part code: CT51264BF160BJ, Dabs quick: 8PQFWS00). The laptop came with a Windows 8.1 Pro license, which is about £100 for a OEM license. It comes with Windows 7 Pro installed and pretty clean build. There was a annoying bits, like a unregistered evaluation copy of WinZip and some annoying favourite websites but nothing as bad as what Lenovo has been installing by default. All the drivers appears to have been loaded via Windows Updates, I then created a installable USB pen drive as there is a no DVD drive on the laptop. You can download the Windows 8.1 installation media direct from Microsoft for free. Once you’ve download it, it will turn a USB pen drive into installation media. 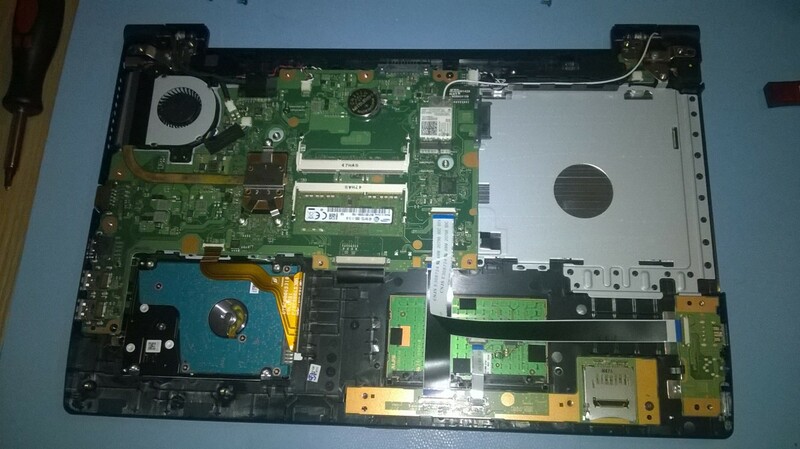 Opening the laptop was simple, they are standard cross screws. This particular model doesn’t have a optical drive. I’ve removed the hdd, I could buy a caddy to use the empty optical drive space, but I’m not a fan of the old traditional spindle hdd, so it had to go, plus I might add a optical drive later. Its nice to had options. The hdd wasn’t actually screwed in place. Its just wedged in, I guess they call this shock absorbing technology. Seems to work pretty well. One thing I will say is to be careful re-assembling it. 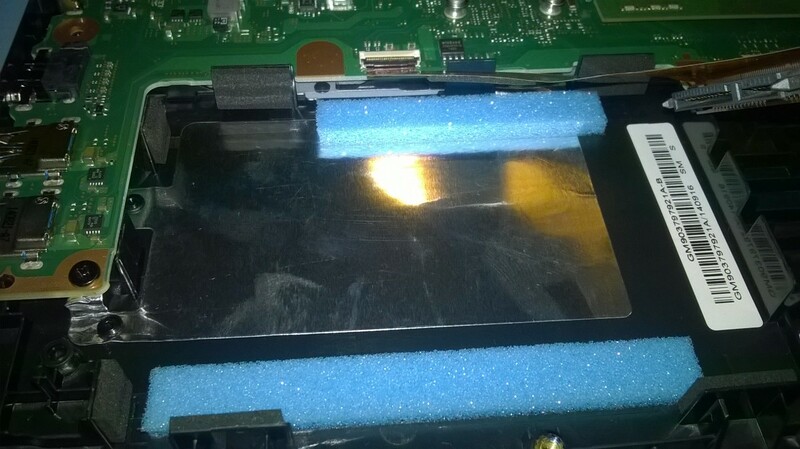 I stupidly over tighten the screws and now have a few bumps under the keyboard.